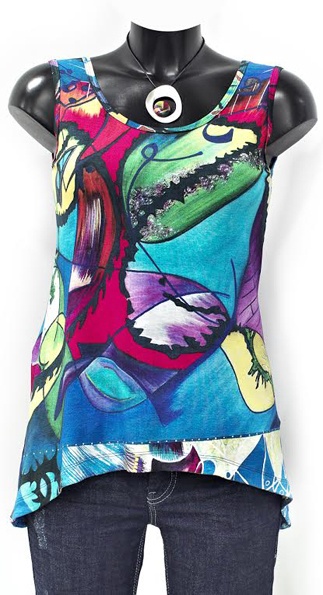 From the belief that “Art provides sensations of well-being” artist Maite Cobo, creates in 2012 “Vas hecha un cuadro”, a clothing and accessories brand based on her paintings, which sells at her shop in Bilbao. All the garments are manufactured in the State, bear the stamp of exclusivity, and are designed for modern women with sizes from 38 to 50 who want to incorporate art in their daily look. They are limited editions, with fabrics stamped with the work of Maite Cobo.